Any speaker wire routing tips? I'm trying to conceal the speaker wires as much as possible, as part of a room makeover. 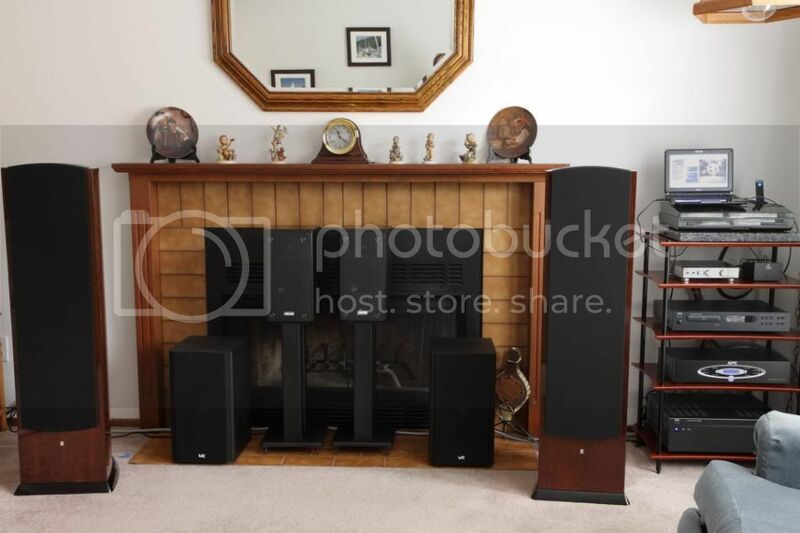 Have decided to keep the speakers on either side of the fireplace for now, and am wondering if there are any better ideas than I can come up with. Going to use Blue Jeans terminated Belden 10-gauge 5T00UP. I'm including the photo from my other, speaker thread. The equipment rack will probably still be in the left or right corner, so only need to hide one wire to the opposite corner area. The options considered so far are to run the wire under the carpet, outside the hearth, using 16' of wire. Worried it might be lumpy under the carpet. What I'm inclined to do right now though, is run the wire through the wall (I already have through-wall access plates near each corner) into the garage, and around the back of the zero clearance fireplace, requiring 20' of wire minimum. I think equal length speaker wires are desirable, but that's going to be a lot of excess wire to the near speaker. I thought of dropping it through the floor, but not excited about crawling under the house. Anyway, just checking for any better ideas. I would just cut a 2-inch slit in the carpet behind the left speaker and another one under the stand on the right, so the wire is under the carpet near the hearth. Once you press the carpet back down, it will be very hard to notice. Run a metal electrician's fish tape under the carpet and then use it to pull the wires through. You can use #14 wire if you do that. The resistance of #14 is very very low for less than 15 feet. If you use #10 for the left speaker and run 20 feet, you can make the resistance of the other short speaker wire somewhat equal by using 14 gauge for it. That will balance the resistance, although it's really not needed. As long as the resistance of the speaker wire is less than 0.2 ohms, it is insignificant. That is 30 feet per wire pair for #12 and 12 feet for #14. Appreciate the thoughts. I hadn't thought of the idea of thinner gauge for the short side to help balance resistance to both channels. Interesting. My choice of the 10-gauge wire was influenced by the following section of the F208's owner manual. "Use high quality loudspeaker cable with a maximum total loop resistance of 0.07 ohms or less for each wire run. Refer to the table below to determine the appropriate wire gauge for your installation. NOTE: High loop resistances that exceed 0.07 ohms (for each wire run) will cause the loudspeakers filter network to be mis-terminated, resulting in considerable degradation of sound quality." I think the 10 AWG Belden 5T00UP is like 0.023 ohms one way for 25 ' or so. It's possible that Revel is being ultra conservative, but I'd like to err, if I can, on the safe side as well. That still leaves me with some fairly thick cable. The carpet is due to be replace within a year. Maybe I can route out some type of a channel in the plywood flooring under the carpet for the final solution. I guess I am hoping for a miracle solution to my problem. I think it might be a mistake to weaken the floor by cutting into it. Carpeting normally has a layer of foam pad at least 3/8 thick under it. You could just have the installer omit the pad for 1 inch or two in front of the hearth, and run the wire across there and tape it down before the carpet goes down. You are right. I didn't consider the under-carpet pad. I'm going to order the cable and ckeck it out.